Nathalie from Avignon pointed out this week on her captivating blog some problems that exist in her local environment with graffiti and tagging. The suggestion was that cities today, even such ancient and architecturally pleasing ones as Avignon, have few if any remaining sacred environments. The problem is universal, with ancient doors, freshly painted white walls, shop windows and even churches being seen as acceptable surfaces to paint on. Her pictures set me thinking. Who are the taggers, why do they tag and what prevents them from tagging? Being fascinated (naturally!) by invisibility, my interest in the subject stems from the contrast between the invisibility of the perpetrators and the distinctly visible traces they leave behind on the face of the city. This simple fact seems to explain many of the issues involved. Is invisibility always something that we choose? Research conducted amongst taggers and graffiti artists around the world has shown that they share some basic traits, notably that they are predominantly male and generally between the ages of 12 and 25. However, there are no defined links to any particular social or racial background, meaning that the phenomenon has spread to almost all geographical locations. Without wanting to fall into the traps of cod psychology, this is clearly an age where individuals are asking many questions and building personal identities. Young men have traditionally had difficulties with self-expression, but may also be wondering where their future place in society will be. 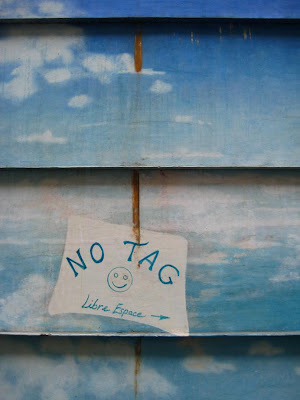 Tagging gives them the opportunity to create an imagined identity (the tag) and to impose this identity on their surroundings. On a more visceral level, it also gives them the thrill of climbing up onto rooftops and doing something illegal. On a technical level, tags exist rather than more advanced multi-coloured pieces simply because not everybody has the talent or the time to work on larger works. Their creations are known as bombing, a night-time activity based on repitition and rapidity. If they find themselves with more time in a more hidden location, they will create a throw-up, a larger two-tone version of the tag. The only aesthetic criteria considered important is that it should be recognisible and easy to produce in the dim orange glow of the streetlight. Are there any parts of the city that remain sacred and untouchable today? Research seems to suggest that city councils that are proactive in this field and offer sanctioned zones suffer less problems, although it would be naive to think that this would put a stop to an activity based around a certain rejection of authority. Near my home though, I discovered one shop owner who had found an original solution. The shutter which protects their establishment at night is decorated with a mural painting on which a 'No Tag' message has been added. To one side, they have added a black panel which they have invited taggers to use. To date, this system seems to be working and their mural has remained tag free. 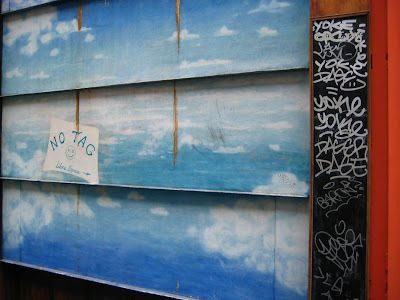 Does this suggest that if our streets were more creative environments there would be less tagging? On a very basic level, many parts of our cities can be seen as a series of flat surfaces, devoid of character and interest. City authorities have no problem sanctioning advertising on many of these surfaces, yet reject street art installations. It would seem to be an experiment worth trying to change some of these parts of the city into canvases of free expression. One tagger I know relates that tagging is an "excuse" for him to explore in depth the hidden corners of his neighbourhood and the city at large. Under the cover of night, he is transformed into the invisible urban anthropologist unencumbered by the attentions of passersby and curious bystanders. Like the dashing Zoro or an errant pooch, he is then moved to mark his territory from other nocturnal raccoon tourists! I agree with your friend's opinion to a certain extent. The most famous street artists, Banksy, Space Invader, the Smiley Cat, are all faceless individuals. Banksy has always gone out of his way to remain a name without anyone knowing what he looks like, despite his worldwide renown today. The second aspect, the exploring and the climbing is understandable too. I think many of us have a desire to appropriate the city and to visit places we never normally would and see things from different angles. For many of the Smiley Cats, 1984s, Space Invaders etc we are left wondering how the artist possibly got to the position and had the time to make the creation without being stopped. It becomes part of the appeal of the piece. However, I can't see this applying to tagging. Tagging is simply signing a canvas without even bothering going through the artist process of making a creation in the first place. I believe that certain places are more or less officially accepting graffitis, e.g. Butte aux Cailles. Jeff Aerosol, MissTic and others have been freely expressing themselves there. Some buildings (blank walls) also elsewhere in the city have got large officially ordered graffitis, as you know. Unfortunately some other experiments, e.g. Rue Cavalotti, have been less successful. The shop owners there had asked graffiti artists to decorate their shutters, but they have since all been tagged. The example you show is interesting and it seems to work – until further! I agree that it would be good to have some more authorized sites, but would it be the same “sport”? I think Jack Lang made proposals in this direction. Great post Adam, and I'm delighted to see the shop you mentioned. Lovely sky mural they have there. I guess the reason why it's worked is that the black board is open to anyone, contrary to the example Peter gives (rue Cavalotti) where specific people were asked to produce an art work and not others. I presume it generated some jealousy? Like certain calligraphic arts, a tag can possess its own artistic merit...seen in the same vein as a personalized form of graphic design. When I visit France I am always disgusted and confused by the tagging. Confused, because as a former New Yorker who has seen that a city CAN control its graffiti problem, I don't understand how a nation can spend billions of euros on beautification of parks, gardens, monuments, and historical sites and yet ignore the taggers' syphilitic chancres that assault citizens as they try to live peaceful and harmonious lives. I wasn't surprised to read that most of these 'thugs' are between the ages of 12 and 25. It explains a great deal, including their total lack of respect for the beauty that surrounds them and their desire to destroy it. Calling them artists is glorifying them and their destructiveness. I don't think you would have found real artists like Picasso, David, or Leonardo vandalizing private property. True, some of them have talent, but this is not the way to display it. I'm truly surprised that more people don't find this unacceptable. Do you know about the work of Miss Tic (http://www.missticinparis.com/) a fiftysomething woman who bombs in a black pencil skirt and stiletto heels and, if photos are to be believed, a pair of shades in the dead of night? She certainly bucks the stereotype. 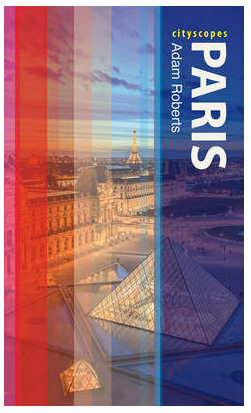 You can see her work around Butte aux Cailles and Abbesses. I'd be interested in hearing more from Daniel about how New York has gone about eradicating its graffiti problem. On a totally unrelated subject: Adam, I think you might enjoy this. Love those shutters and hope it continues to work! Badaude, I've seen MissTic's work in Abbesses and it's great. (Thanks for the link to her site). However, it is also a million miles away from tagging. Although tagging is graffiti, not all graffiti is tagging. I agree with Adam that the latter is signing a canvas without the creation: clumsy, endlessly repeated scribbles of a few letters have little in common with the work of someone who is proud to say 'je donne a penser'. Some tags are very nice--we had a nice bit of stenciling and people tagged it, it was looking fine until the property owner painted it over. And it was in an alley, so it made no sense to remove it. 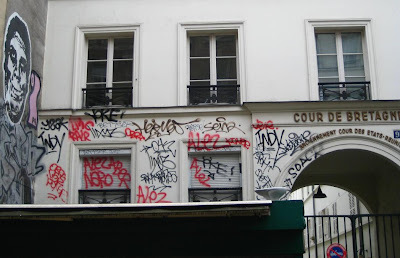 However some graffiti (on ornate buildings for example) is just tiresome and unpleasant to view. I like the black frame in your photo. Fascinating blog. No tagging in Vegas, at least not on the Strip.Is tagging the mark of a neighborhood going downscale? A youth center, with an invitation to decorate it at will?